I like the new scavenge mission setup in principle, great move. Level auto-balances to our current top level (though that caught me by surprise, the mission going up a level soon as I finished upgrading my TG heh) and you have the option of normal (top level) or hard (top +2) which gives the hard chargers an option to earn better. But the rewards are waaaaaaaay low for the Hard missions. 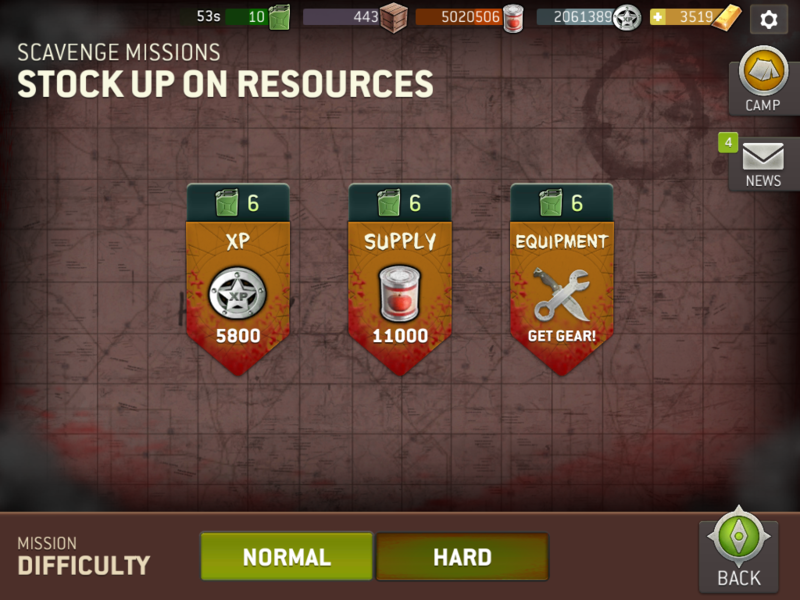 I go into a mission with walkers starting out 2 levels higher than my survivors (3 if I haven't trained them yet) only to get an extra 300 XP or 1000 supplies as a reward? There's a good chance at least one person's getting bruised, I need more than that! The reward crates, you say? I think someone forgot to update the algorithm. Output of the crates seems the same as on Normal, if they are higher it is by as small an amount as the mission reward, practically unnoticeable. This is most evident on the gear mission (thanks, BTW, for fixing that - at first they didn't even yield gear in the crates) - I just finished 2 gear missions in a row on Hard where I open a *gold* crate to find ... level 19 rare (green, 3-star) armor?!? I expect to find that at minimum on *Normal*, where's the phat loot for beating a Hard mission? On Hard, the gear in normal crates should be no lower than 3-star at level up to 1-star 2 levels over. A gold crate should be netting me level 20 3-star gear at bare minimum, with a good chance of 4/5-star level 20 or 3-star level 21 gear. Especially since we have to rely on the RNG whether we get that crate at all in the first place. 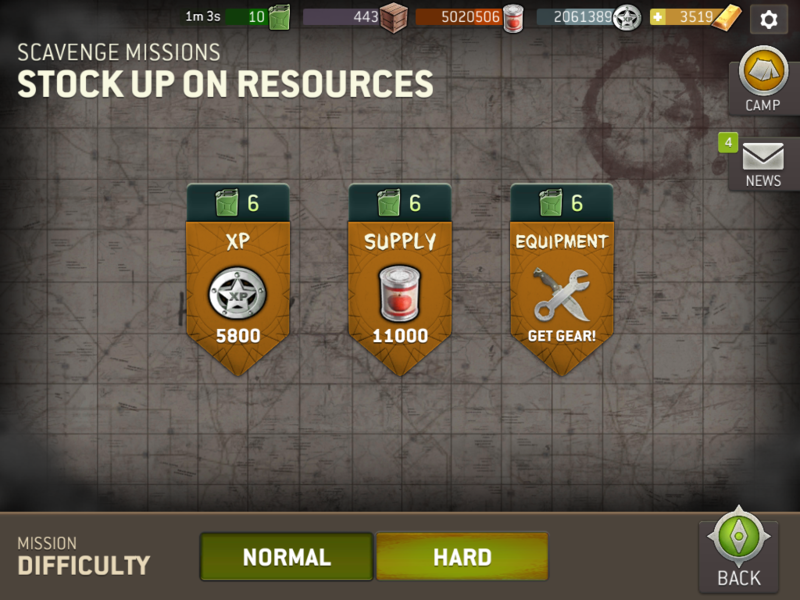 Please please PLEASE take a look at that algorithm, and adjust the mission rewards for the XP/supplies missions on Hard. As they are right now, they aren't worth the time and fuel, I am better off just sticking to Normal. And I have the same rewards in normal and hard mode? It's because there seems to be a cap on scavenge mission rewards as well as on the crate rewards afterwards. So what you're getting is poor rewards for hard-mode, not good rewards for normal-mode. So if your normal mode is level 20 recommended or above, there's no benefit from doing the hard ones because all the rewards are exactly the same (the only difference is the XP you get from killing walkers, which start higher on hard-mode, but makes it more difficult to farm beyond the first wave). So the system puts end-gamers at a disadvantage. @Shteevie acknowledged the issues a few days ago and said he would look into a fix. I don't know if the reduction in gas prices to 6 from 7 was the fix he meant, but I hope it wasn't. I sure NG will honor it's philosophy or harder missions giving better rewards. It's probably different at high level, but the crate rewards are very different for me. My survivors are only level 10, but when I do a Hard mission, I get gear that's level 11-13. If I'm reading this thread correctly, then the walkers people face are only higher than their survivors on the hard level, is that right? My survivors are at level 19 (my max currently), but when I do a normal scavenger missions for supplies I am facing level 21 walkers. If they are respawns some of those increase in level,..
@DanDare something is screwy there. Should be facing 18- 19 when you level up on easy. I've stopped complaining. It is beyond rediculous for me. I thought it might change when I maximized player level (preupdate) but it did not and I'm still looking for the same stuff I was a month ago. 19th level gear for some of my classes has been hard to get in rare, let alone anything better. I've seen people posting pictures but that doesn't do me much good. And no, I'm not spending trade goods when we have equipment runs still on the table. Maybe in a few weeks, but I'm still upgrading the walker pit.